May 31, 2015 Geren W. Mortensen, Jr.
Last night, I enjoyed the Rush R40 Tour concert at Jiffy Lube Live (formerly Nissan Pavilion) in Virginia. It was a great show, with the band really cranking out some great performances. I apologize in advance for the really crappy video. All I had with me was my iPhone 5, and I was seated in the lawn. I've already posted some even crappier stills on Facebook. For me, though, this concert was not about taking pictures or video. It was about enjoying the show. And that, I did! And so, for your amusement, here's much of the show condensed to about eight-and-a-half minutes, in little bits and pieces. Some folks have said recently that Geddy Lee's voice is ... lacking ... and that he's unable to do the songs as well as he used to. I'll admit that there were a few moments where he was straining, or made some interesting melodic decisions. But, at 61, to expect Lee to be able to nail vocals as he did 20, 30 or 40 years ago is ridiculous. I think he did an awesome job. It was also apparent to me that he was not entirely pleased with his monitor mix, and I can relate (from experience); when you can't hear yourself properly, it's hard to sing properly. I also heard several comments from attendees stating that his voice was better than it's been in years. In any case, as this was my first Rush show (! ), I had no basis for comparison, except for concert videos I've seen over the years -- made when Lee was younger. And, for a man with horrible arthritis, Neil Peart drums like there's no tomorrow, and still makes it look all too easy. If you didn't know he was in pain, well, you wouldn't know from his playing. The man can play some drums. Enough said. Alex Lifeson pretty much ruled the stage, from a guitar standpoint. I was told he muffed up something pretty badly, but I missed it, either because it happened when I was in the restroom, or he recovered so expertly that it slid right past me. My only real complaint about the evening was that the house mix was really not right for the first three songs. There was no definition in the drums, and the vocals were lost in the "mush" of drum and bass. There was also a distinct problem in the delay settings for the lawn fills -- I could hear the slight mistiming, and it was really pretty annoying. While I certainly understand that things change during the course of a day, and that a full house sounds different from a full house (and it was a full house! ), but at this level, they really ought to be able to compensate at least a little, and not having the delay settings right at the start is inexcusable. After the first three songs, things got better, and quickly. 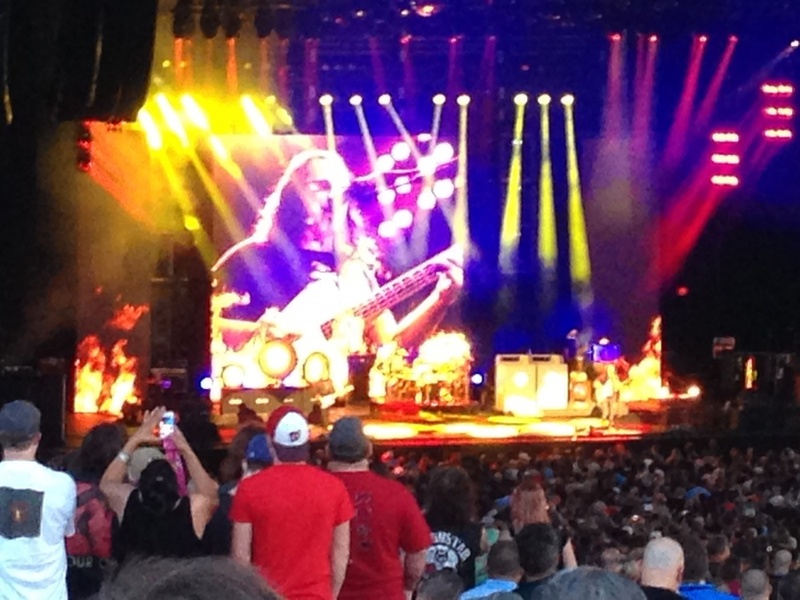 The bottom line is this: If you like Rush, you owe it to yourself to see this show if you can. It could be your last chance, as the word is that this is the last big tour for Rush. I know I'd pay to see it again!